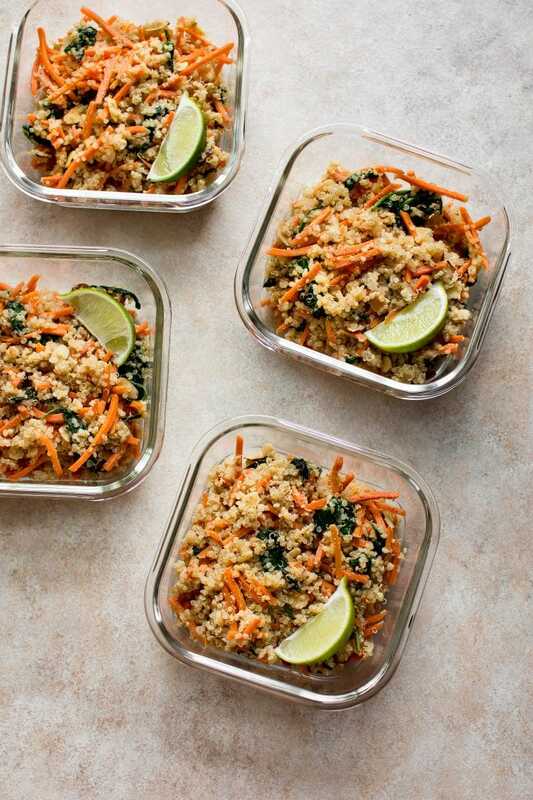 These vegan meal prep bowls are loaded with quinoa, spinach, carrots, almonds, and a delicious ginger/garlic/soy dressing! Ready in only 30 minutes, and this recipe makes 4 meals. These vegan meal prep bowls make an excellent light but filling lunch. I took the leftovers to work, and they kept me full until dinner. 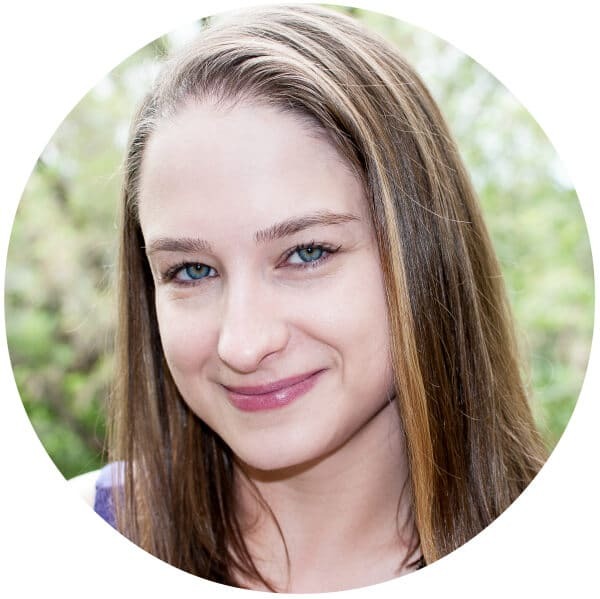 I have a number of vegan meal prep recipes on here, including my vegan Mediterranean meal prep bowls, my vegan sweet potato meal prep bowls, and a roundup of 30 vegan meal prep recipes. I eat this recipe cold like a salad. You could definitely heat it up, though. I really like the way the crunch of the raw carrots and almonds balances the quinoa and cooked spinach. As you all know by now, I’m not much into spice, but I think sriracha sauce would go really well in here if you like it. These veggie meal prep bowls really couldn’t be easier to make. 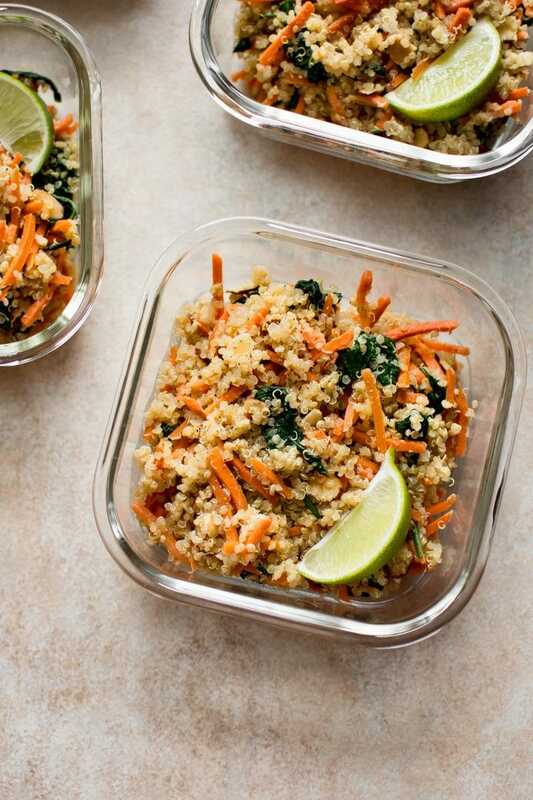 You cook the quinoa and prep the other ingredients while it’s cooking. I wilt the spinach with some olive oil, soy sauce, garlic, and ginger. I then stir in the rest of the ingredients and the quinoa. Done and done. 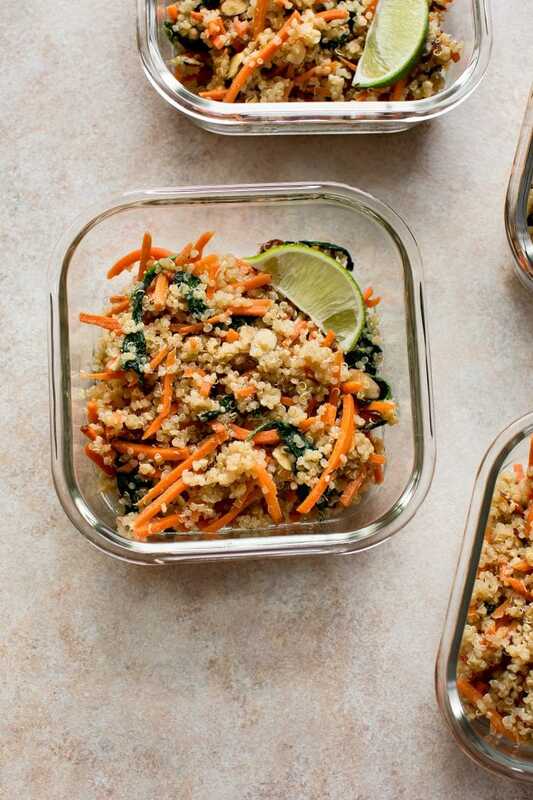 Will you give these quinoa meal prep bowls a try? Questions? Let me know in the comments below! 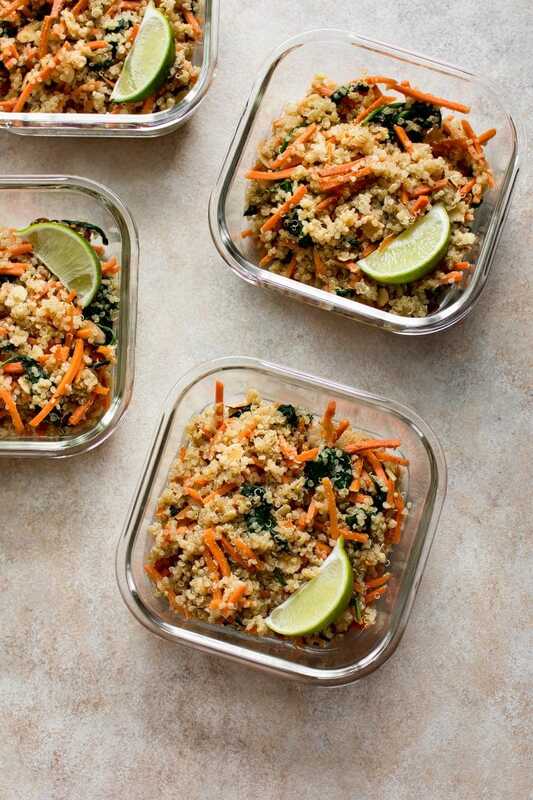 These vegan meal prep bowls are loaded with quinoa, spinach, carrots, almonds, and a delicious ginger/garlic/soy dressing! Meanwhile, prep the other ingredients. When the quinoa's about done, add the oil, garlic, soy sauce, and ginger to a skillet over medium-high heat. Cook for about a minute. Add the spinach and cook until it's wilted. Remove the pan from the heat. Stir in the almonds, carrots, toasted sesame oil, lime juice, sriracha (if using), pepper, and quinoa. Toss until combined. Divide into 4 meal prep containers. Handy trick: the ginger is much easier to grate if it's frozen. I always keep some fresh ginger in the freezer and I use my Microplane grater/zester to easily grate it. These are the meal prep bowls pictured. If you prefer rectangular ones, try these. You can check out all of my meal prep recipes if you wish. I’ve never heard of a prep bowl. I had to look it up. I’m still not positive, though. In this case, it’s a type of salad? Anyway, I love quinoa and spinach. Hi Jeff! Meal prep is basically a new-ish way of describing making (preparing) multiple meals to get your through the week (or at least a few days). It’s something I’ve always done, but these days it’s quite trendy for time-saving and health & fitness purposes. Yeah, this is basically a hearty salad divided into four containers, but I decided to call it meal prep because people searching for vegan meal prep recipes will be able to find it easier. As far as I know, meal prep can basically be anything that lasts for a few days. Loaded with so much goodness, such a perfect idea for lunch! A delicious combination of ingredients Natasha! So perfect for lunch on my busy days! I’m always looking for meals like this that keep me satisfied for hours! Meal prep is my fave! First time quinoa cooker here. Just made this recipe and was very pleasantly surprised how full of flavour this is and how much I love it!! Thanks!!! I am soo happy to hear that, Nadine!! Hi 🙂 What are the nutrition facts of this meal? Hi! I don’t have the nutrition info – sorry. I don’t calculate it for all recipes (even then I just do calories because I’m not a trained nutritionist). I suggest plugging in the exact ingredients you used into an online calculator and that’ll give you a pretty good idea.